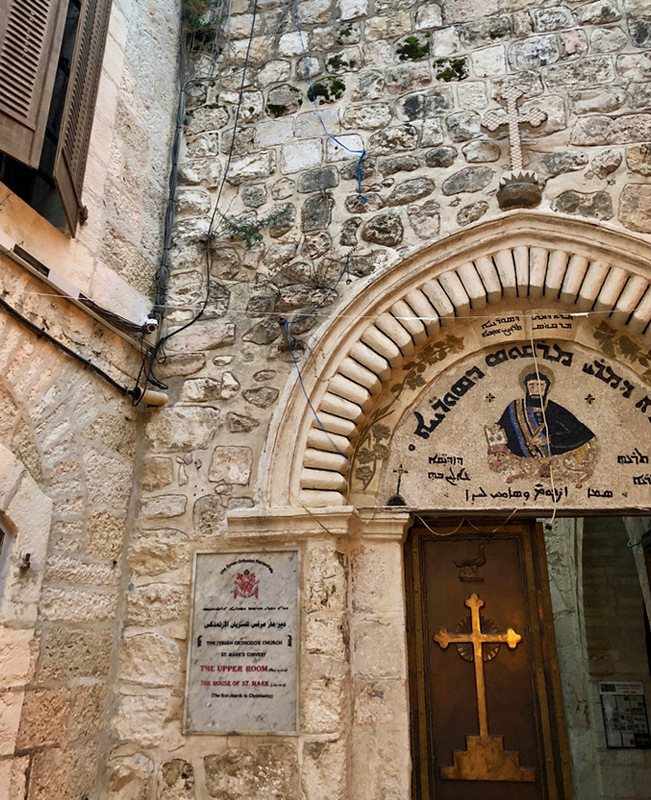 Down the Winding Streets of Jerusalem’s Old City is San Marcos Church, or, “The Upper Room.” It is the center of the Syrian Orthodox community, and, according to their tradition, the site of the Last Supper and the Holy Spirit coming down at Pentecost. The scene is set, the table prepared, and the actors in place. The camera zooms in as we see the strong and worn hands of the carpenter’s son, slowly and gently lift an ordinary cup, a cup now sanctified by that which it bears. Jesus has eagerly waited for this moment – to be seated at the table with his closest friends, including the one who will betray him. As the community of believers, his disciples, join and drink from the cup, the camera’s focus slowly shifts, and we see the carpenter’s son break the bread. As he does this, his words remind the disciples of the sanctity of this moment. We’ve read these verses countless times. We’ve seen Da Vinci, Tintorreto and other renowned artists depict the scene in paintings, producers bring this moment to life in films, and we’ve interpreted these roles in our church plays. What exactly did this scene look like? Was Jesus speaking softly or loudly? Were his movements quick? Or paced and measured? None of us can be sure. However, as I reflected on verses 14-23, here is the question that came to mind: If I were to write the script for a play, what would I title this scene? (What would you title this scene?) When I read and re-read these verses about the Lord’s Supper, I come back to simply this: The Extraordinary in the Ordinary. It was a day of what might seem like ordinary events. Peter and John were tasked to go prepare the place where this last meal would take place. This preparation involved organizing the sacrifice of lambs in the temple, cooking them, preparing the place, assembling the side dishes and utensils, and serving the wine. When Jesus and his disciples arrived in the room, everything was set. They’d all done this before; friends gathering around a table, deepening relationships, and breaking bread. Yet, this was the last time they would all be gathered together. The event in that room, around that table, the cup, the bread – each seemingly ordinary. Jesus loves the ordinary. No matter our accomplishments or great feats, you and I are ordinary human beings. Yet it is Christ in us, his Holy Spirit working through us, He who breathed life into our frames, who gives way to the extraordinary. For it is Christ who sanctifies and divinely repurposes that which is ordinary, just like he did during this sacred Last Supper. This was his farewell meal, wrought with emotion and holy truth. Betrayed by one seated at the table among them, Jesus was going to walk towards his death. His ministry on earth was coming to an end, and only the future messianic banquet would unite them again in this same way. His death was necessary to pay for our sins and establish a new covenant between man and his Creator. But for this covenant to be complete, blood would be shed. The scene is set. The room, the table, the cup, the bread - ordinary but sanctified. It is the institution of the Last Supper – our Eucharist, our sacred extraordinary. Thanks be to our God. Maralee Gutierrez serves as the coordinator for our church’s global and neighborhood engagement. She has been attending The Falls Church Anglican for six years. She is also the Founder and Executive Director of Comunidad, a nonprofit that equips and engages locally-rooted community leaders in Falls Church.